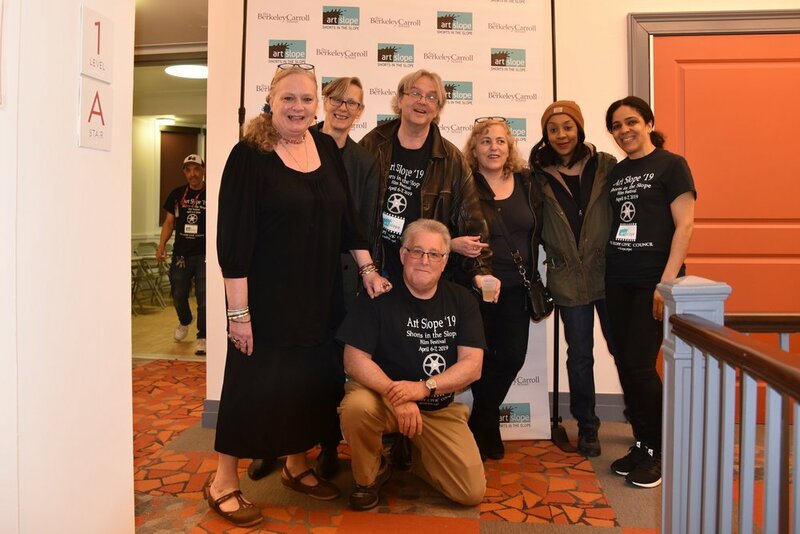 The Park Slope Civic Council was pleased to present Art Slope '19 - ‘Shorts in the Slope’ film festival over the weekend of April 6 and 7 at the Berkeley Carroll School's state of the art performance space. Enthusiastic audiences joined us for two days of incredible short films from Brooklyn and around the world - in four separate screenings. We were also excited to present our inaugural youth film festival - which featured short films made by kids from ages 7-18 - as well as films that were kid-friendly. After the first day's screening, we hosted a reception and filmmaker meet-and-greet in the theater lobby, and the festival concluded on Sunday with an After Party and Awards Ceremony at Gowanus' celebrated Shapeshifter Lab! Trophies for the winners were designed by Park Slope Civic Council Trustee and artist Myra Kooy. Filmmakers gather on stage for Q&A with emcee John Mazurek. After Party and Awards Ceremony at ShapeShifter Lab, April 7, 2019. Emcee John Mazurek presents Christopher Ming Ryan with award for Best Documentary Short for “Philip Carlson - On Behalf of Talent’. Best Youth Short - ages 7-13: Jesse Ray Scheps - "Jesse Ray Scheps Sketch Comedy"
Best Youth Short - ages 14-18: Steven Ruggiero - "Clark"
Best Narrative Short: Mohsen Mehri Deravi - "Sluggish Life"
Best Documentary Short: Christopher Ming Ryan - "Philip Carlson - On Behalf of Talent"
Many thanks to all of the talented filmmakers who shared their work with us! Please come back to visit our site as more photos and festival information will be posted, including videos of the filmmaker Q&As. Shorts in the Slope is an initiative of Art Slope, the arts advocacy committee of the Park Slope Civic Council, a not-for-profit organization whose mission is to enhance the lives of Park Slope residents and visitors since 1896. The Art Slope ‘19 ‘Shorts in the Slope’ Committee (L to R): Jeanette Lee, Regi Mueller, Bill Curry, Ron Weiss (kneeling), Lee Boyes, Time Darden, Linda Wilson (not pictured: Donna Epstein and Peppy). Robinson Tejeda of Berkeley Carroll School in the background.